Burn Time: Approx. 5 Hours each. Wrapped in a natural cellophane bag with a handwritten label for the fragrance name. 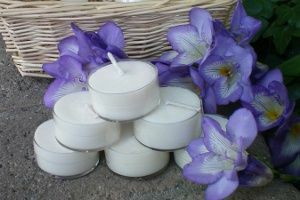 Natural soy wax does not hold color well, so expect fading. We do not use UV inhibitors in our candles. We offer 6 packs so you don't have to buy 12 of the same scent.